NEW YORK CITY, Feb 8, 2019 – GFNY returns to Argentina, to a new host city, San Juan. San Juan is known by cycling fans around the world as the location of pro race Vuelta a San Juan. GFNY Argentina – San Juan will take cyclists through the spectacular and diverse lands of the Argentine northwest. Both the long and medium routes start and finish in the San Juan city center. GFNY Argentina riders can expect to race through a region with beautiful scenery at the foot of the Andes Mountains in warm spring temperatures. The route will have the same police support as Vuelta a San Juan for road closures, providing riders the full ‘Be a Pro For a Day’ experience on a course that is recognized on the professional World Tour. The long route is 154km / 96 miles with 1300m / 4265ft of climbing. Long course riders will need to complete two laps in the Ullum Valley, up to Punta Negra dam, crossing the spectacular Interlagos route with its commanding views and finishing in the center of San Juan. The medium route is 91km / 57 miles with 670m / 2200ft of climbing and follows the long route for a single lap to the valley of Ullum, Punta Negra dam and Interlagos route. The long route will serve as a qualifier for the Racer Corral at the 2020 Campagnolo GFNY World Championship in NYC. 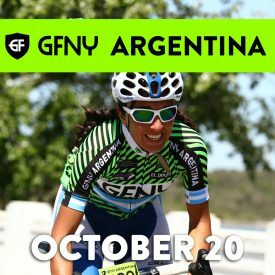 GFNY Argentina also offers one of the last chances of the year to rack up one “GFNY finish” towards earning the coveted 3×2019 medal, for finishing either the long or medium route at three GFNYs in the 2019 calendar year. GFNY is the global cycling marathon brand with events held in NYC, Argentina, Bali-Indonesia, Brazil, Chile, Colombia, Costa Rica Ecuador, Italy, Jerusalem-Israel, Cozumel-Mexico, Monterrey-Mexico, Panama, Philippines, Portugal, República Dominicana, Santa Fe-USA and Uruguay.